FP - Huge Game Between the Lions and Cardinals. No, Seriously. 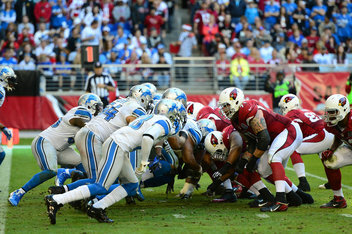 As the top 2 seeds in the NFC prepare to meet this weekend in Arizona, I did a little research to complete the following joke: Big game between the Lions and Cardinals? What is this ? Unfortunately for me, that year doesn't exist. The Cards have been around as long as the NFL (1920). The Lions (nee Portsmouth Spartans) have been around since 1930. They both made the playoffs in the same year exactly once and that didn't count. In the strike year of 1982 the Cardinals were 5-4 and the Lions somehow made the playoffs at 4-5 (hence, didn't count). In '83, the Lions made the playoffs at 9-7, the Cards missed out at 8-7-1. That was the last year that both teams had winning records. So, are we destined for a Lions Cardinals NFC Championship game that would more than likely signal the apocalypse? Probably not. As you know, the Cardinals lost their starting quarterback last week, but they were 2-1 under Drew Stanton who has yet to throw an INT in 93 attempts this year and have a 2 game lead on the defending Super Bowl champs. The Lions have a 1 game lead plus a head to head win over the NFL's hottest team. That division will most likely come down to the week 17 Lions @ Packers game, which probably won't have a happy ending for Biggie. Speaking of the Packers, they host the 7-2 Eagles on Sunday in what is the real NFC game of the week. So the season probably won't end with a trip to Arizona for either of these two teams (Uh, I mean in the Super Bowl, the Cardinals season probably will end with a trip to Arizona. You know what I meant). But for one week at least we can all enjoy a Cardinals Lions game that actually means something for the first and probably last time. Hey, somebody woke up Freeland! Couple good games this week, but this one is gonna be huge I think. Didn't get to see Stanton earlier this year so my opinion is prolly worthless (you know, more than usual), but I predict a win by the Leos. Not a blowout, but a good solid disciplined win. As for SB in AZ: Not gonna be a home game for the Cards. Regardless of the NFC entrant, if my Pats are SB bound, I just might have to consider wrangling some (pricey) tix to that event just up the road. If it's Pats/Leos, Big and I have already agreed not to speak for a couple weeks afterward. Maybe before, too. But Feb. is a long way away. Watch us get stuck with (um, I mean treated to) an Iggles/Browns Toilet Bowl. Given that Stanton ran the scout team in Detroit for Suh's first two seasons, I'd wager this has already happened. without the red shirt this time, though.